TGIF! I am so happy that today is the end of the week. I have had such an exhausting week. Today is challenge day over at Paper Cutz Challenge. This week's challenge is "Stars, Circles and Diamonds, Oh My!" Make a card, LO or craft project for Halloween using stars, circles or diamonds and any colors you'd like. For the challenge, I decided to make a card using Stampin' Up! Out on a Limb stamp set. I must admit I got this idea from Linda's Stamping School. I love how it turned out. I hope you enjoy and don't forget to participate in this week's challenge. Basic Black Card Stock from SU! Designer Series Paper from SU! Basic Grey, Cajun Craze, Staz-on Ink from SU! 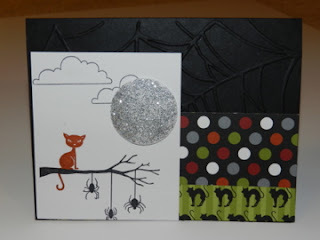 Spiderweb embossing folder from SU! I love the cat and the silver moon! Awesome card!! This is awesome. I love the glittery moon. Love the moon and the the cute little spiders. This is so cute, Candice! I love the glittery moon!! Love this card! Super cute! !